Not to be confused with Daniel Bissell (general). Daniel Bissell (December 30, 1754 – August 21, 1824) was a soldier and spy for the Continental Army during the American Revolutionary War. He was the son of Daniel and Elizabeth Bissell and was born in Windsor, Hartford County, Connecticut Colony (Now East Windsor in 1754. On April 1, 1776, signed on for the duration as a corporal in the 5th Connecticut Regiment. He became a sergeant on September 1, 1777, and ended the war with the 2nd Connecticut Regiment. Under the direct orders of General George Washington, Bissell posed as a deserter in the city of New York from August 14, 1781, to September 29, 1782. He realized that to get the information Washington needed, he would have to join the British Army: for 13 months, he served in the British Infantry Corps led by Benedict Arnold. Bissell memorized everything he was able to find out and then made his way back to friendly lines where he was placed under arrest until Washington verified his story. Sergeant Bissell was able to furnish valuable information including detailed maps he drew of the enemy's positions. He was to become the last recipient of the Badge of Military Merit in June 1783. Washington is given credit for designing the Purple Heart but it started when Bissell was at a ball with his future wife and Washington, while Bissell was dancing with her he stepped on her purple dress and ripped a piece off. He took the piece of fabric and folded into a heart and told his wife to hold onto it. 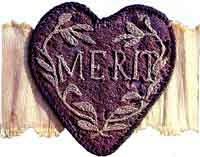 When Washington learned of this is what gave him the idea to make the Purple Heart and that is where it originated from. This was published in a book that follows multiple families that are documented past the 1400's, one of which includes the Bissells. The award was lost in a house fire in 1813. During the Quasi War with France, Bissell served in the US Army. He was commissioned a First Lieutenant in the 16th Infantry Regiment on March 3, 1799 and was discharged on June 15, 1800. Bissell died in 1824 in Richmond, New York, where he is buried in Allens Hill Cemetery. His tombstone is inscribed, "In memory of Daniel Bissell, Who died August 21st, 1824, Aged 70 Years, He had the confidence of Washington and served under him." ^ "Remarkable Sergeants" (PDF). NCOHistory.com. 2003. Retrieved 2003-03-30. ^ "National Infantry Museum". U.S. Army Infantry. 2006. Archived from the original on 2007-06-24. Retrieved 2006-07-09. "Daniel Bissell". Find a Grave. Retrieved 2008-07-25. This page was last edited on 14 October 2018, at 12:40 (UTC).